Fondazione Farmafactoring is delighted to present the Italian photographic exhibition: “La lunga vita. 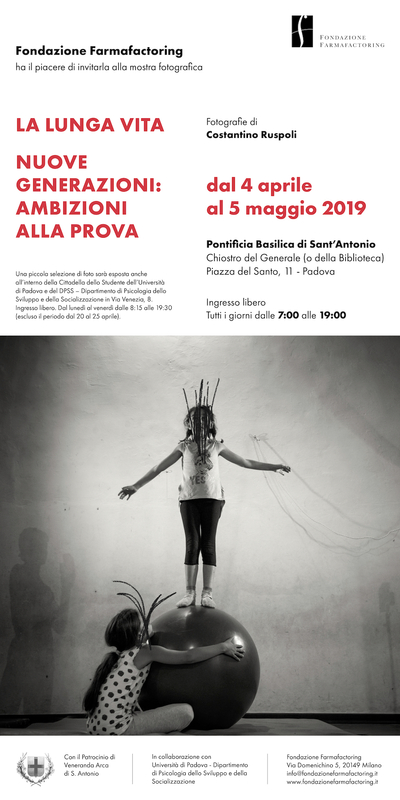 Nuove generazioni: ambizioni alla prova”, taking place in Padua from April 4th to May 5th2019 at Chiostro del Generale (Pontifical Basilica of Saint Anthony of Padua). The artist and photographer, Costantino Ruspoli, and the curator, Alessandro Scotti, have focused on nowadays teenagers: the exhibition shows their habits and behaviors, with specific attention on actions rather than on identities, resulting in the artistic intervention of erased faces.